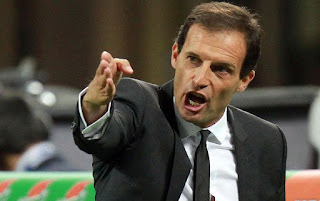 According to latest reports, Juventus manager Massimo Allegri is keen on a takeover at Arsenal when Arsene Wenger leaves. The Frenchman who is under big pressure to resign has not made a decision on his future yet despite having a contract that expires at the end of the season. No one knows if this will be his last season as all attempts to make him pen a deal has fallen on stony ground. He has asked the club to wait till April before getting a response from him. Many feel Arsenal's fate at the end of the campaign will have a big impact in his career at the club i.e. if Arsenal end up winning something, he will stay but if the reverse is the case, then he will wave the Emirates goodbye. With his future in doubt, the Gunners have already lined up a number of replacements, with Allegri being the favourite for the job. It is believed that the the Italian coach has made his intentions of taking over from Wenger known and has asked his agent to keep close tabs on the situation. We also gathered that discussions are already ongoing between both parties and should Wenger decide to quit, Allegri will be the next in line.